When my husband and I were first married he was shocked by the giant tin of olive oil I would buy quite frequently when shopping. I have learned to use a little less oil in my cooking, but it is still the foundation of most of my dishes. My husband may have been surprised at the quantity of olive oil that was in my cooking, but he was pleased when his cholesterol and weight went down after living with me for less than a year. Olive oil contains MUFA, monounsaturated fatty acid which has been linked to many health benefits including lower cholesterol and reducing your risk of heart disease. Grapeseed oil is a more neutral tasting oil and has a higher smoke point than olive oil. It has gained recognition lately because there is evidence that grapeseed oil can reduce bad cholesterol. It is now being distributed by Pompeian a well know and respected oil and vinegar company. I have used Pompeian's products on and off for years, so I jumped at the chance to let you know about their newest products. Pompeian Olive Oil, a leader in olive oils and vinegars, wants to help you celebrate National Grilling Month! 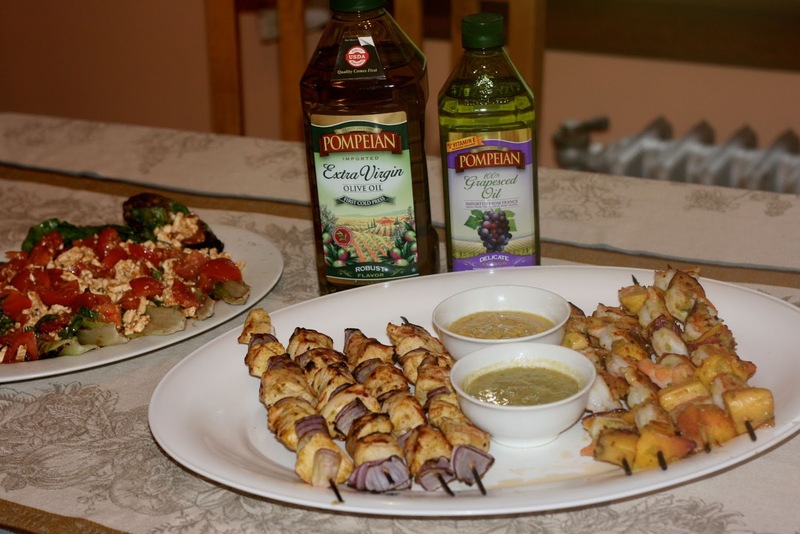 Pompeian products give you a taste of the Mediterranean without leaving your backyard. 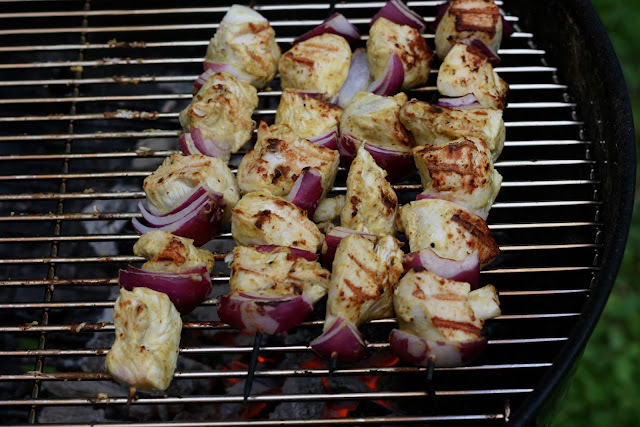 By using Pompeian Grapeseed Oil and OlivExtra Mediterranean Blend products you can make grilling healthier and more flavorful in a Mediterranean way. For more information about Pompeian Olive Oil, please visit http://pompeian.com/. I tried all three of the Hungry Girl recipes and my family was quite pleased. They actually worked well together as one meal. The sweet and hot flavor of the shrimp dish complemented the warm vinegar taste of the mustard chicken. 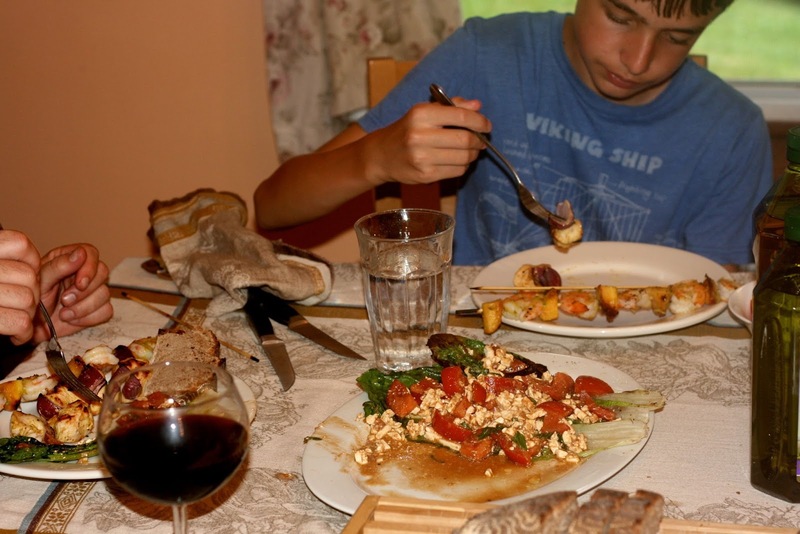 The feta and tomatoes in the romaine salad helped to reduce the heat of the whole meal. 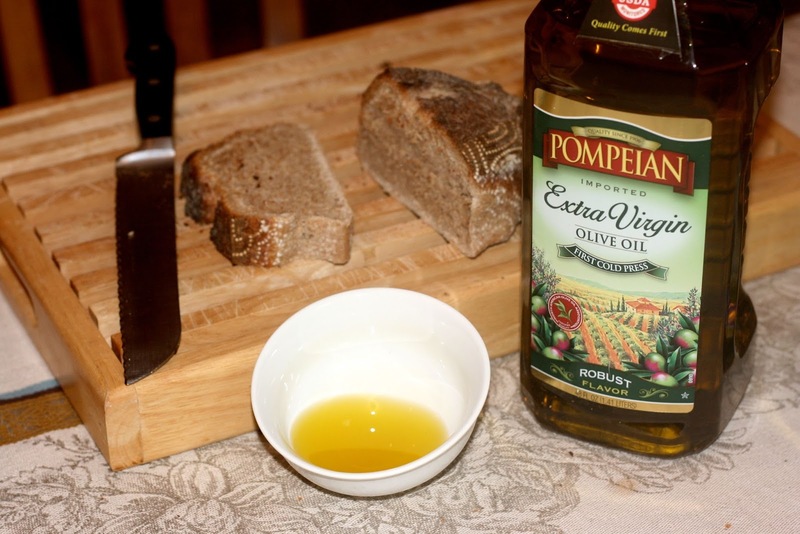 We added a little of my husband's homemade bread to the dinner, so we could enjoy the robust flavor of Pompeian's Extra Virgin Oil oil solo. There is is nothing more delicious than dipping bread in good olive oil. 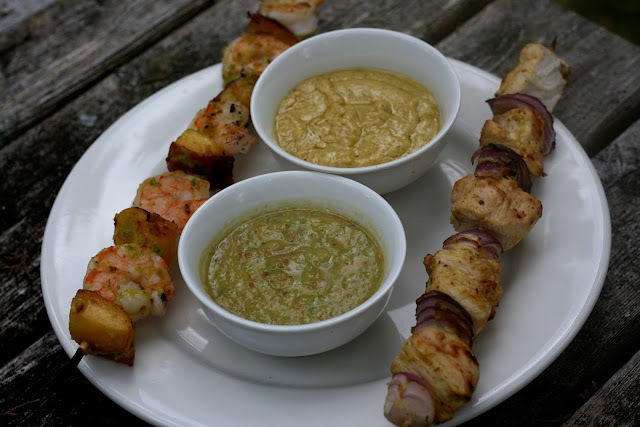 Both the chicken and the shrimp recipe come complete with a dipping sauce. My family loves to dip. The chicken sauce is a mustard base made with Pompeian's white wine vinegar and their new OlivExtra Premium Mediterranean Blend oil. This is a classic very appealing mustard sauce that I plan on using with ham too. 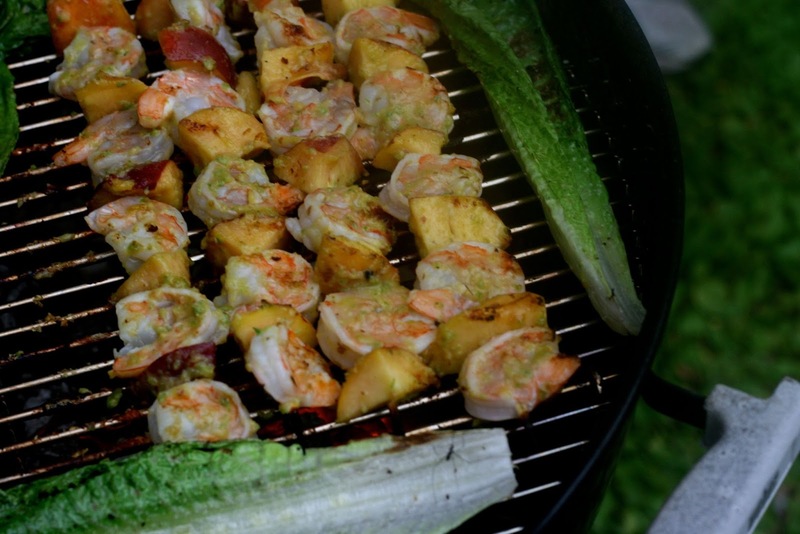 The shrimp dish includes a jalapeno peach salsa that is made with Pompeian's grapeseed oil. The contrast between peach and jalapeno is a burst of summer flavor. The recipe calls for canned peaches, but because they are in season, I used fresh ones. My kids wanted to dip corn chips in the leftover salsa... I haven't even begun to think of the other uses for this salsa. Maybe you can help me out? The real surprise of the meal was the Grilled Romaine Salad. 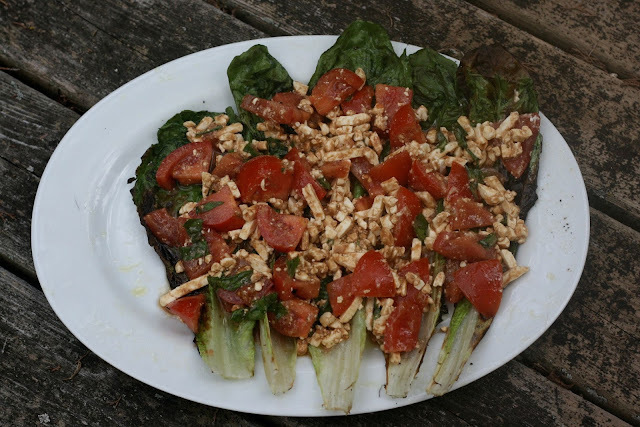 My husband thought I was a little crazy when I asked him to char romaine leaves... after all he had just grilled peaches. Well my husband and my kids... along with myself were really impressed by the flavor transformation that occurred to both the romaine and the peaches. The romaine was no longer a lettuce... it was some exotic green vegetable, and the peaches actually acquired a complexity to their flavor, like they had been marinated in liquor. I invite you to give Pompeian's products a whirl with these really interesting flavor combos from Hungry Girl. I think you will be very pleasantly surprised at what a fun and healthy meal you will end up with... we really enjoyed it! 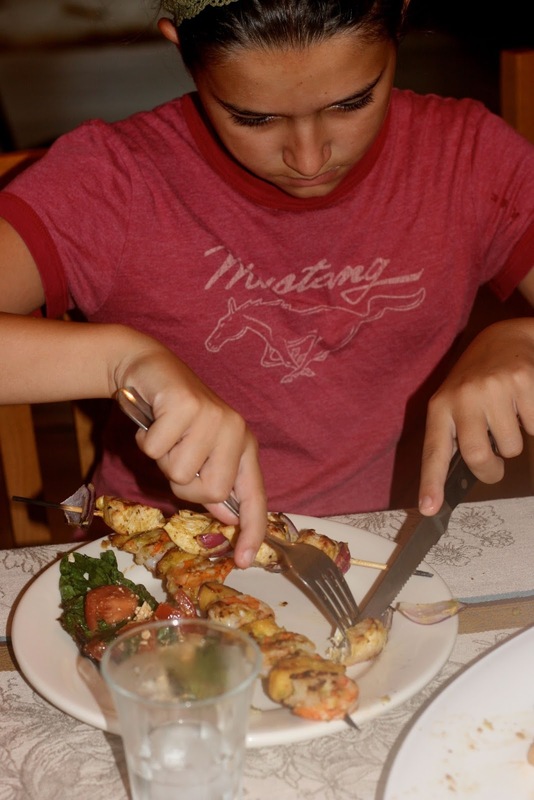 Sunday: Peach Salsa from this recipe Jalapeno Peach Shrimp Skewers over boiled ham with roasted potatoes. Meatless Monday: Leftover Hungry Grilled Romaine Salad mixed with pasta. Do try the grilled peaches... really different taste and the Romaine slightly salted and charred very interesting flavor. You are very welcome Marty... I hope you get to make them together. The flavors work well. It is funny isn't it... well even for adults presentation matters. all three look fantastic ! can't wait to try the salad and the chicken recipes. Your oil lineup looks like mine. I have that big bottle of Pompien Extra Virgin Olive Oil and the smaller bottle of Grapeseed Oil. 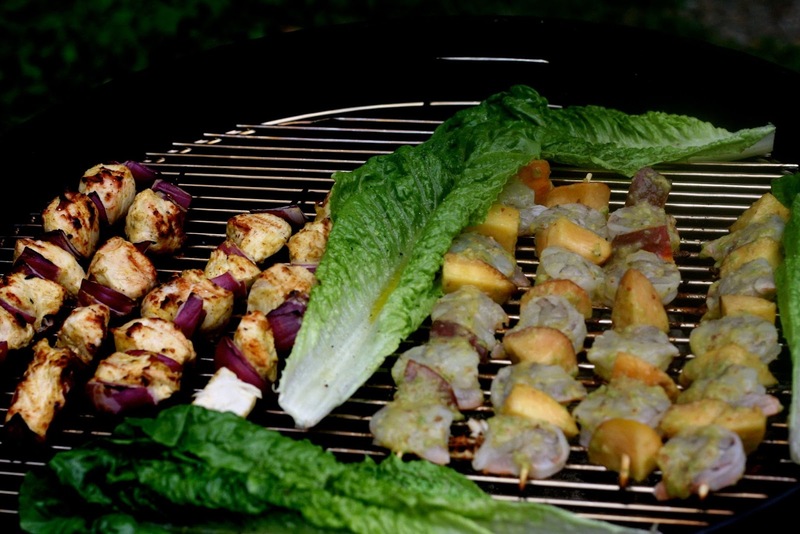 And I just love grilling veggies! Everything looks good, Diane! They are good oils. I've been curious about grapeseed oil for a while and I really like how light it is... nice flavor, very subtle makes it versatile. As a Greek I couldn't have agreed with you more regarding olive oil! In Greece we mainly consume this type of oil since we are one of the three major producers of olive oil. And Greeks are some of the healthiest people in the world too. All the studies on super longevity take place on your islands... lifestyle and diet. You guys have it right. Diane, this whole meal is speaking my kind of language! It seems like the perfect way to enjoy a summer evening. I live in constant regret that I don't own a grill but I'm sure these will work great on the ol' panini grill :) I love Mediterranean cooking and am excited to try some of your recipes! PS: I found you through the Wednesday Fresh Food link up. So glad to have you visit Amy... You can definitely grill this under your broiler. Shrimp cooks really fast and as long as you cut the chicken pieces small they will cook too.